WAIT, WHAT THE HECK IS THAT THING? NINTENDO, why do you do this? Why do you make scary bosses for the cutest character in Nintendo? Also, why the heck do you have to make KIRBY GAMES SO FREAK'N HARD. But seriously. 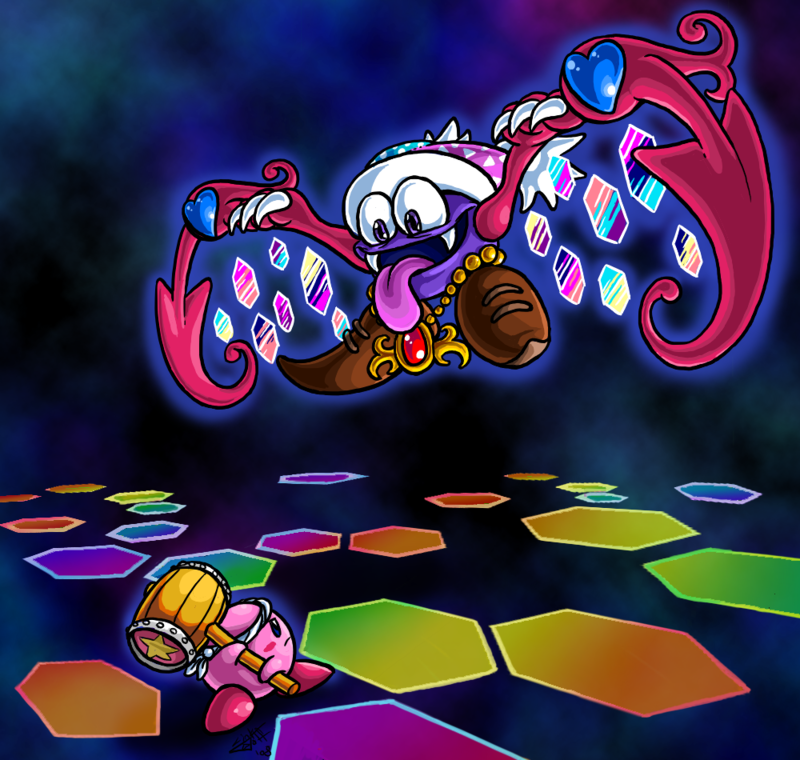 Does anyone get the feeling that some of the designers for Kirby games were on drugs? Designer1: Hey, we should make all the characters cute to appeal to a younger audience. Designer2: Absolutely! I'll get Designer3 to do the boss designs. Designer3: Great! But tell him the deadline is wednesday. Does anyone get the feeling that some of the designers for Kirby games were on drugs? You're not far off, he's drooling. I'm down. Doctor Kirby and Super Tough Mech Puff! Still not convincing me to buy Amibos, though. Oh yeah for sure, I ain't throwin down $180 for a New 3DS just so I can get UFO and Smash Kirby. The levelling up aspect sounds interesting. "and the irreplaceable waddle dee". I BELEIVE YOU MEANT ANIMAL FRIENDS AND ADELEINE. I need a dedede figure. And yeah , triple deluxe 2 looks good, kinda wish they carried over Kirby fighters but , eh. Kirby hype! Planet Robobot looks too good. I can't contain the hype. So I got Planet Robobot yesterday when it came out, been playing it since then. I'll reserve a full judgement of the game until I complete it, but my initial thoughts are overwhelmingly positive. From what I've played so far, this game is potentially one of the best mainstream Kirby games out there. Heh. I remmeber when I got my Nintendo DS. (Just regular DS Lite for me.) My first game was Kirby Superstar Ultra. It made a large impact on me and I will never forget the little puffball. I've been playing robobot non-stop, and I just beat the true arena today with poison. (all the new abilities are pretty op, but poison takes the cake.) Holy hell , it was hard, especially the final boss. I actually had to use amiibo. The hardest incarnation of the true arena, by far. EDIT: I just beat it again with whip, without amiibo, and 3 minutes faster. Welp. The hardest incarnation of the true arena, by far. I haven't tried Poison or Whip though (been sticking with my homeboy Hammer), so I might give that a shot.